You are currently browsing articles tagged Pet. Macho, tough Buster, chaser of cats and bully of Abby, is scared. But, it was as if Buster had ESP. Our talk didn’t fool Buster one bit. He cowered and shook with fear. He seemed to know what was coming. 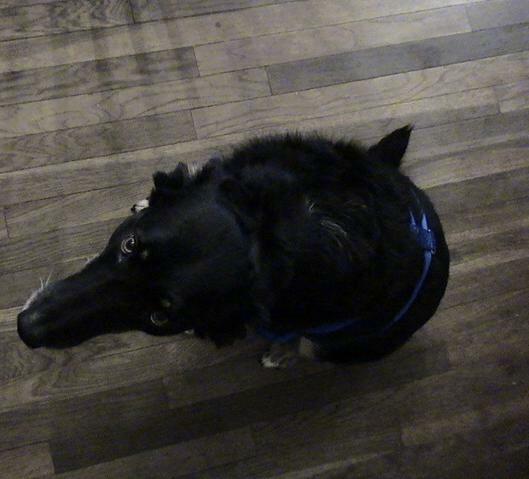 Buster is so upset because of the harness, I had to hold his head up to get him to look at me. He was also plotting his escape. Buster wasn’t going sit and let it happen either. At the first opportunity he bolted through the dogdoor and hid in our backyard. DH had to go out and get him and carry him to the jeep. 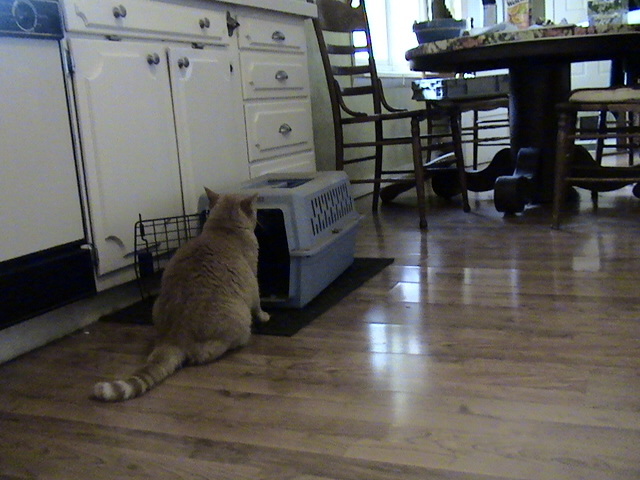 In the meantime, I was in charge of putting Biggs in the cat carrier. 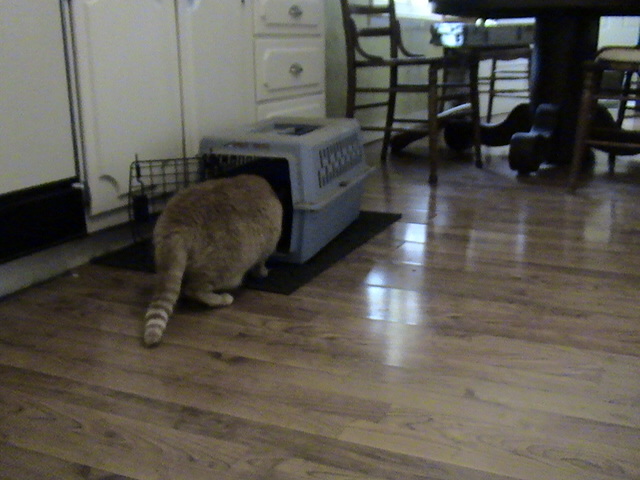 Biggs inspects the cat carrier. Then Biggs strolls on in. I had only to shut the cat carrier door after Biggs went in on her own. 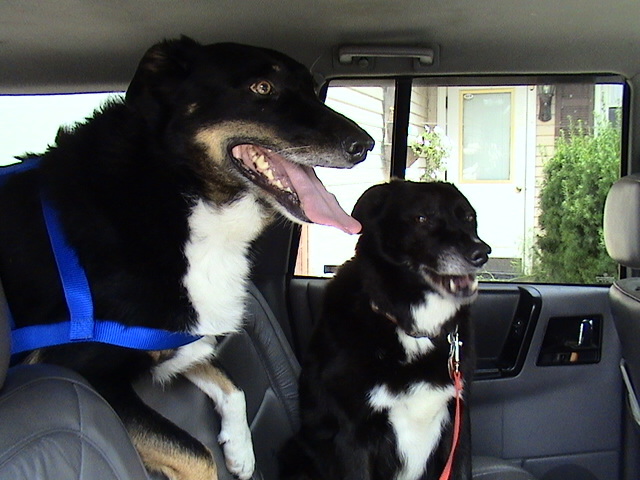 Abby proudly let me put her regular collar on, strutted out to the jeep and hopped in. 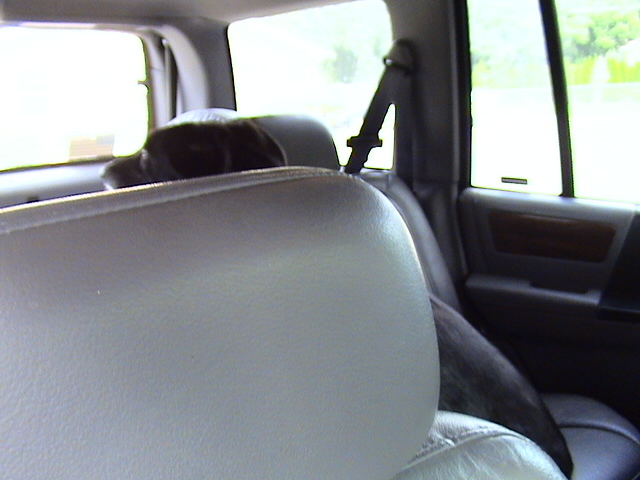 Except for Abby getting carsick and drooling and Biggs meowing, the ride to Maplecrest Animal Hospital was uneventful. Once we got to there, Abby practically drug me into the front waiting room. Then, DH signed everyone in and Buster retreated to hide in the corner with his head under a chair. Buster is still wide-eyed. Abby is calm, but soon drooling from carsickness. 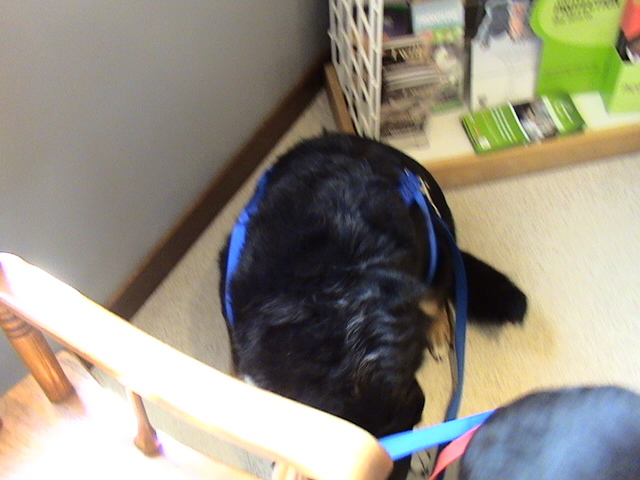 Buster hiding in the corner of the waiting room. 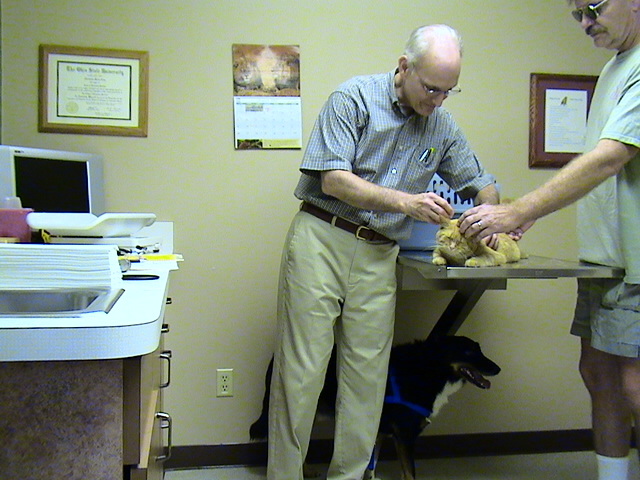 There was a different veterinarian in the office today, Dr. Jeff Longenbaugh. He won Abby and I over when he said her weight was just fine. Biggs didn’t fare as well. Eleven and a half pounds is a lot for such a small boned cat. But, despite all the talk about her fatness, Biggs purred contentedly through the examination and her vacinations. Buster didn’t recognize the vet and clung to him avoiding DH and I. I think Buster was remembering past times DH and I had betrayed him in the examining room. Once the vet took out the syringe to draw blood, though, DH had to help hold Buster down. Biggs purrs through her embarrassing weigh-in and vaccinations. 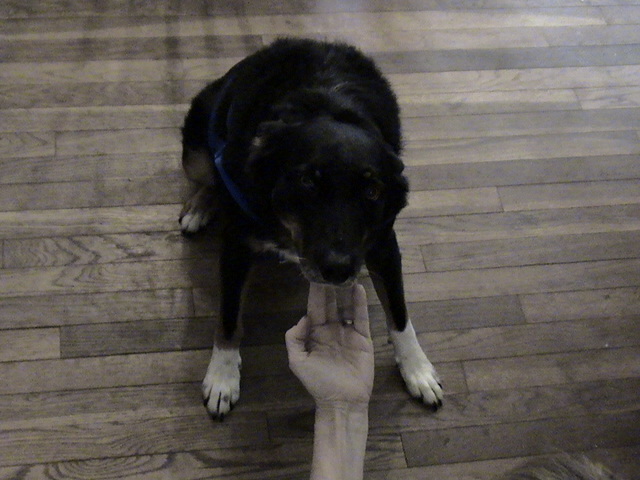 Abby had an old scab from a tick bite. No fleas, ear mites, heartworms or signs of problems. Everyone got a clean bill of health. DH paid. We will be back again next year. In the meantime, I would like to thank the veterinarian, Dr. Jeff Longenbaugh and the staff at Maplecrest Animal Hospital. 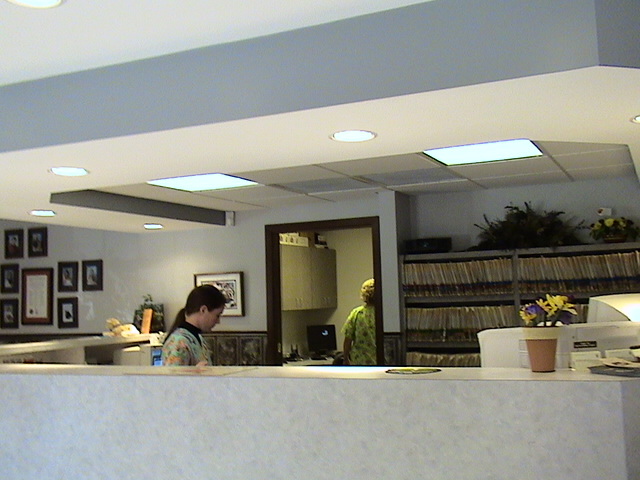 Maplecrest Animal Hospital’s staff is hard at work. The dogs lie low on the way home.